An MP was assaulted after confronting two men who stepped in front of a car driven by his girlfriend, a court has heard. Independent John Woodcock, who represents Barrow-in-Furness, suffered grazing to the knee in the incident in Ambleside last June, it is claimed. Barrow magistrates heard Spectator deputy editor Isabel Hardman was at the wheel of the car. Michael Wilkes, 27, of Headland Rise, Walney, has denied assault. The trial had been due to start but the hearing was postponed after the court was told Ms Hardman was unable to attend due to mental health problems. Judge Chalk "very reluctantly" agreed to an application to adjourn proceedings until 4 June. Peter Bardsley, prosecuting, said Mr Woodcock and Ms Hardman were travelling through Ambleside on the evening of 1 June when two people stepped out in front of their car. After Mr Woodcock got out of the vehicle, it is claimed Mr Wilkes pushed him to the ground and caused grazing to his knee. 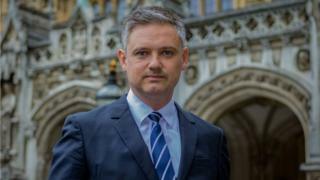 Mr Woodcock quit as a Labour MP last July after the party suspended him over claims he sent inappropriate messages to a former female member of staff, which he denies.